Chris Christie didn't actually get rid of Common Core in New Jersey. Chris Christie Claims He Got Rid of Common Core in New Jersey. That’s Baloney. New Jersey Gov. Chris Christie, left, and Sen. Marco Rubio spar in the Republican presidential debate on Jan. 14, 2016, in South Carolina. 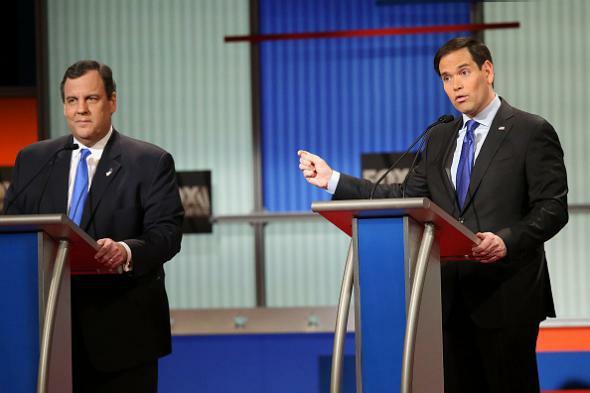 In Thursday night’s Republican debate, Sen. Marco Rubio made a pointed attack against New Jersey Gov. Chris Christie, accusing one of his main rivals for a top spot in the New Hampshire primary of being pro–Common Core. Christie, though, thought he had a killer response: “Common Core has been eliminated in New Jersey.” Too bad for Christie, the actual standards that constitute Common Core are still alive and well in his state. All Christie eliminated was the name. I was a teacher in New Jersey when Christie first started hemming and hawing over Common Core’s waning national popularity. But not a single teacher I knew panicked. They knew he wasn’t serious—and they were right. New Jersey is still using the exact same tests as before, ones that are aligned with the exact same Common Core standards for what students should master by each grade level. Christie may no longer call New Jersey’s educational standards “Common Core,” but for students in the state there is absolutely no difference. In his 2015 announcement that New Jersey’s testing standards would be changed, Christie said he wanted new recommendations by the end of the year, which itself was a significant indication that he never intended to alter the standards in any serious way. Coming up with an entirely new set of standards takes years, not months. For Christie, Common Core was always intended to stay intact, with or without the name. This tactic of conservative governors rejecting the unpopular-in-red-states name while keeping the substance isn’t new. Of the more than 40 states that have adopted the Common Core, one-third of them are now calling it something else, almost certainly out of political expediency. Changing the name allowed these states to quell the anger of people who knew very little about the standards themselves, without actually making any meaningful changes. Ohio Gov. John Kasich, also a Republican primary candidate, adopted the standards in his state, which calls it “Ohio’s Learning Standards.” Go to the website for these standards and you won’t see “Common Core” written anywhere, even though that’s where the standards come from. Kasich himself—a Common Core supporter—almost never says the words Common Core on the campaign trail. Jeb Bush also supports the standards, but his home state of Florida also calls them by a more voter-friendly euphemism: “Next Generation Sunshine State Standards.” Schools run by the Department of Defense (known as DoDEA schools) never called the standards “Common Core,” avoiding the fight to begin with, even though national standards are an obvious boon to military children, who frequently move across the country and have to restart their education every time. “Defuse” is exactly what Christie, and every other governor who chose to rename the standards, was doing. And, frankly, that’s all they could ever do. Let Christie’s experience be a lesson for every single candidate on that stage that Common Core isn’t going anywhere. Not even Sen. Ted Cruz—who said he would “repeal every word” of the standards—could make that happen. Tests costing millions of dollars have been written. Teachers have changed their entire curricula. Textbooks have been redeveloped and distributed. Children have changed the way they approach school. None of this will change, and attempting to force it to would cost millions of dollars and take a decade. That’s why Christie could only change the name, and that’s why Cruz cannot simply eradicate Common Core in the event he is sworn in next January. Education hasn’t been a big issue in this election on either side, but it behooves the candidates to tell the truth on the rare occasions on which it is mentioned. The Common Core is alive and well in New Jersey. And it will be alive and well across the country, regardless of what these candidates say they might do as president.